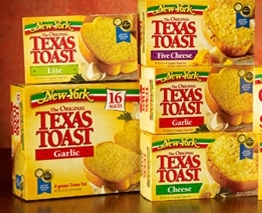 I know we have been having issues with the New York Texas Toast coupons on Smart Source the last couple of days. They appear and they disappear within hours. Not sure what that is about..BUT, I found a new coupon! Yay! And it is also for $.50/1 for New York Texas Toast. So, if you are a ShopRite shopper you can score free boxes of Texas Toast starting on Wednesday at their 4 Day sale.